The ultimate guide to Soll ski holidays in 2019 & 2020. The hub of the SkiWelt area, Söll’s a traditional and animated village at the foot of the Hohe Salve Mountain, looking out to the rugged Wilder Kaiser massif. 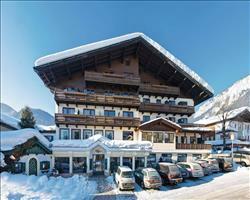 With lots on for families, some smashing Austrian après and mile after mile to ski, the resort’s become a firm favourite with Brits over the years, and rightly so. Between the Wilder Kaiser Mountains and the Hohe Salve (one of Austria’s highest peaks) Söll’s the main resort in the SkiWelt - Austria’s largest lift-linked ski area. Getting here’s easy - you’re no more than an hour away from Innsbruck airport and those travelling by rail can get here in about 15 minutes from Woergl. Having left behind the reputation gained in the 80s as a ‘lads’ holiday hotspot, this is now one of the finest family resorts around. Kindergarten areas, child-care services, an indoor chill-zone, night tobogganing and visits to the Igloo Village are just a few of the fantastic offerings in the area - which as a whole has a friendly, lively feel. While its reputation has changed over time, the gorgeously traditional buildings have remained, with baroque and chalet-style structures making this a popular winter and summer destination for its architecture alone. The centrepiece of the village is an 18th century domed church, where its candle-lit graveyard adds an eerie yet beautiful feel to the village. That’s not to say technology hasn’t evolved on the mountain – the lift system and snowmaking is excellent and this is one of the biggest night skiing areas in the Alps, with state-of-the-art floodlights bringing 10km of pistes to life after dark. Lift access comes in the form of the ‘SkiWelt Wilder Kaiser-Brixental’ pass - the name may be a mouthful, but you’ll say it with a smile when you hear that the pass encompasses all 9 of SkiWelt’s interconnected resorts. The Hochsöll gondola’s a 15 minute walk from the town (arguably the perfect pre-ski warm-up...) or for a little less legwork, frequent buses run between the village and the slopes. View our detailed Soll snow forecast or snow report and see all live webcams, piste maps, road and travel maps and lift pass prices. For a picture of historic snow conditions see the snow depths month by month with our Soll snow history. Beginners will find a high standard of learning facilities in the area, with Skischule Söll providing a number of courses for different age groups. There’s a collection of nursery slopes near the village and you can catch the gondola up to Hochsöll for access to some short and sweet blues. This is also where you’ll find the Kinderland area, tailor made for mini skiers with a gentle slope and ski merry-go-round. A word to the wise: the main run leading back to resort is a red, which sometimes gets icy at the end of the day – it might be best to get the gondola down until you’re confident on the intermediate terrain. Speaking of which, intermediates have oodles to play on. Take the gondola up to Hohe Salve, SkiWelt’s highest point at 1829m, where pistes 44 and 45 lead back down to Hochsöll and a number of others take you to the surrounding villages – enough to explore a different area each day. Advanced skiers won’t find steeps, deeps and bumps galore but if you’re happy to clock up the miles on reds, test out the black runs from Hohe Salve and dabble in a bit of off-piste, you can still have a cracking time here. Hochsöll’s home to a new snow park (accessed via the Rinner chairlift) with an Easy Line, and medium jib and kicker lines and there’s a funslope under the Salvenmoos chairlift with jumps, boxes, tubes, bank curves and waves. 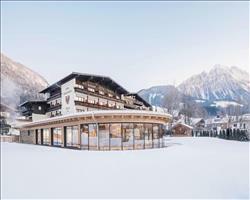 You’ll also find two more parks further afield in Ellmau and Westendorf. Night skiing is where this resort really stands out from the rest, with a whopping 10km of runs, the medium line of the snowpark and the funslope lit up 3-4 nights a week. Though this is a quaint Austrian village with big offerings for families, there’s no doubt that Söll still knows how to have a good time. Before you ski back down, stop at the Gipfelalm on Hohe Salve for a drink with a 360° panorama of over 70 high alpine peaks. Salvenstadl is always a favourite après ski spot, with live music, DJ’s and their famous hot apple cider tempting people from the slopes from 3pm. Anyone in need of some home comfort will love the Brit-style Red Horse sports bar, with TVs showing big events like the 6 Nations and champions league and regular live music events. You’ll find a number of restaurants dotted around the village centre: for sizeable portions at good prices, we love the cosy Söller Stuben while Bella Vita is great value for money, with starters big enough to share and the best steak in the area. In terms of other things to do and see, the Alpiniglu igloo village over in Hochbrixen can be easily reached by both skiers and non-skiers – with ice sculptures and an ice bar it’s well worth a visit. There’s always tobogganing available, including a 4km floodlit run to accompany the area’s impressive night skiing scene. When is the best time to ski Soll? This isn’t the most snowsure resort in the Alps but the Hohe Salve has the highest skiing in the region, making Söll a safe bet for some of the best conditions in the SkiWelt. February usually sees the most snowfall, while huge investments in technology have seen slopes stay open from December to the end of March in recent years. The area has over 1500 snow cannons which provide extra dusting on an enormous 245km of piste when temperatures are below zero. In an attempt to leave behind the boozy image that once haunted Söll in the 80s, there has been continuous work over the years to try and reel in the parents and kids, resulting in a fantastically family friendly ski resort. Some of the facilities making it so appealing to families are ski schools with years of experience, like Söll-Hochsöll, who also offer professional childcare for kids who are too young to ski, so the parents are free to enjoy the stunning scenery on offer. Older kids who fancy themselves as snowboard or ski tricksters can head off to the Snowpark or Funslope and try out a few new skills. As can be expected from a resort where families are so well catered for, Söll doesn’t disappoint in the accommodation department. You’ll find cosy, yet suitably spacious chalets (we like Chalet Sonnenhof), which make a great place for some much needed rest and relaxation after a long day on the slopes. For state-of-the-art accommodation with great facilities, choose one of our homely hotels, the Postwirt and Tyrol always proving popular choices. Whilst unfortunately there are no ski-in ski-out opportunities in Söll, there is a useful ski bus which will take you straight to the lifts, or if your children don’t mind the walk, then the slopes are a pleasant 15 minute walk from the village. Söll can cater to groups of all sizes, whilst ensuring that there is something for everyone on the trip. SkiWelt’s varying terrains offer runs for people of all levels, from absolute beginners who can benefit from ski schools, like Söll-Hochsöll and Knolln, and nursery slopes (numbered 57 & 58 on the piste map), to experienced skiers, who will find black runs, like piste number 23, worthy challenges. There is also plenty to keep any non-skiers entertained, including paragliding and tobogganing to name but a couple, before experts, beginners and non-skiers alike can all meet up in one of many bars or restaurants and recount the day’s adventures. With something here for everyone, set aside your fears of leaving people out, and get booking! You’ll find plenty of accommodation which welcomes groups, ranging from large half-board hotels, to having the whole place to yourselves in a cosy chalet. If there are stragglers who wait til the last minute to decide that they don’t want to miss out on your group holiday (let’s face it, there’s always one) then Hotel Fuchs or Tyrol are good options, both with a large enough capacity to accommodate the late-comers. For ultimate group accommodation experience, book a chalet all to yourselves, check out the maximum occupancies below then ask us to get a quote for you on whichever take your fancy. Should you wish to make your own way to you accommodation in Söll, simply select ‘independent travel’ below, but we all know how difficult organising travel for a group can be. Let us give you and helping hand and book one of our great value package deals, including flights, transfers and of course the group accommodation of your choice. "A good ski area all round"
We normally go to different ski resorts but went back to Söll on purpose as we enjoyed it so much. The only way Söll would be better is if there was more going on in the town itself – there’s more going on in the nearby towns. Söll mainly has restaurants, bars and a couple of very good supermarkets. I’d recommend the resort to people of all ages, the après is very good for young people and there were also quite a few elderly people there who’d been coming back for years. The skiing’s excellent, with some lovely long runs. Soll’s quite central so you can ski to one side and go over to Westendorf and Brixen or ski to the other side for Ellmau and Scheffau. Some people skied all the way to Kitzbühel but that takes a lot of skiing in one day. There are slopes for all levels, we saw quite a lot of people tottering about who were clearly beginners as well as people zooming around who were more advanced (towards Westendorf the runs get more mogully if you want more of a challenge). You can also do night skiing in Söll which we didn’t get round to, but the light up a lot of the runs so you can ski until around 9pm. 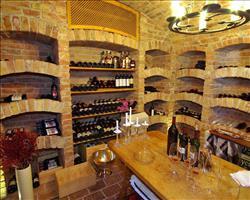 "Soll is a gem - huge area, much cheaper than France"
Soll is fantastic, it’s a gem. 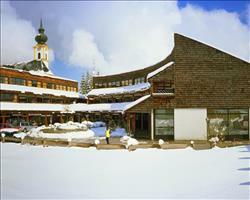 The area is so big - the biggest skiing area in Austria – and covers a few different resorts. Good mix of terrain for boarders and skiers and some great restaurants on the mountain. A lot of people head to France, I’ve been here in December, January, February and March and it’s always been quiet. It’s also really cheap compared to France, 3 euro for a pint of beer and 6 euro for pizza where you’d pay something like 20 in a French resort. "We’ve been coming back for a decade"
A bunch of us have been skiing here for 10 years because the facilities are so good. You take your skis and boots up to the cable car station and put them in there, so that when you go up in the bus you can wear ordinary shoes and just get changed and out onto the slopes – the skis are ready and waiting and the boots are nice and heated. You have access to the whole ski area and can go right over to Kitzbühel now as they’ve added a connecting lift. You go up to the middle station from the cable car and have access to 5 chair lifts and a cable car which goes up to 6000 foot – half of the group do this and ski round the mountain to other villages and the rest stay around Soll. I tend to stay in the Hochsoll region and get the occasional bus to Ellmau (you can get there, have lunch and come back all in a day). We’ve never had a bad year in terms of snow and they have snowmakers on nearly all of the runs which certainly helps. The last time I went was the very beginning of January but I’ve also been here at the last week of March when the round about was free of snow but the runs were still in good condition. There are some nice places in the village with good Austrian music and good food. If you’re teenagers there are also places that are on till the early morning. At one time this was a loud place but now it’s no such thing, very quiet and friendly. There are two ways to fly into Soll – to Innsbruck or Salzburg. I’d recommend Innsbruck as it’s slightly shorter. Soll is very nice, there are quite a few different slopes including some nice challenging ones (there are easier ones too but I find it’s always good to push yourself!). 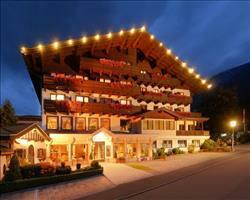 Some people I know went back again this year which is an example of how nice a resort Soll is. We went to a few bars and restaurants, if you were there looking for a wild party you wouldn’t be in the right resort, but there’s a good selection of places to go. I find Austrian ski resorts are generally the best. The accommodation is usually clean and tidy and well looked after. 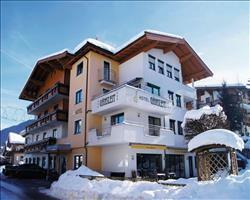 Soll and Austrian resorts in general are great value for money. Soll itself is more of an intermediate resort which is fine if you’d like to stay on piste, but if you’re looking for off-piste or advanced stuff there isn’t really much. There’s a park I think but I wouldn’t go here for the park alone. Off the slopes there isn’t a lot going on. The après is alright but it’s not like St. Anton, it’s quite spread out. 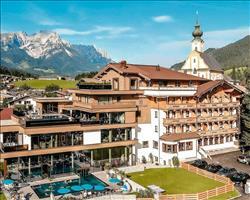 I think Soll is probably good if you are going with a few mates or for families. We’d been to Mayrhofen and St Anton before, Soll is quite small in comparison but the ski area is excellent and suits us. As snowboarders we found it great fun and didn’t mind the slush at the end of the season. It’s probably best for middle to advanced level skiers/snowboarders. There were a couple of bars in the village with atmosphere but we tended to just go back to our chalet. 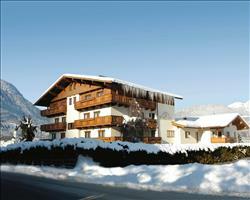 Soll is a pretty, normal Austrian village – smart chalets with stylish architecture and not too twee. 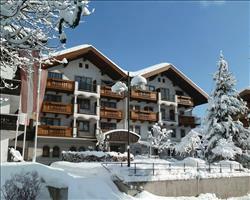 The price of things on the mountains is very reasonable and the restaurants became popular with everyone in our chalet. It was nice not having to watch our pennies while eating and drinking as everything was English prices. There’s nothing wrong with Soll’s ski area, but I probably wouldn’t go back – I keep going to other places then returning to Sölden which I love! We were quite fortunate as we managed to get snow – the previous week there wasn’t any snow at resort level. The pistes were quite clear. All runs seemed to come back to one point… But whereas in other resorts you’d find people milling around and meeting up there, here it kind of dissipated. There wasn’t a mega buzz about it. Overall we didn’t think the resort was amazing, usually you’re lured into shops and end up with new goggles or earmuffs but you didn’t get that here. It just didn’t have the same atmosphere of the places we’d been before – even the French resort we stayed in last year had a bit more character. Our friends who’ve skied loads of times said they’d rather stay in Going. We skied over to Ellmau and back (which you can just about do in one day) and would have preferred to be staying in Ellmau and skiing over to Soll instead. We’re not ones to go out and about a lot, but we did have a nice meal at the Postwirt hotel which is bang in the centre of the resort. A handy tip: A friend stayed in Soll the week before and had their skis stolen. They realised that if you leave your skis in the resort during certain hours you’re not covered by insurance. Having thoroughly read the small print this time round, my husband and I decided to swap our skis and put the odd pairs together whenever we left them, in order to make it more difficult. I’ve been to Soll a couple of times before – the SkiWelt’s a good area of nice slopes and the apres is great (go to Whiskymuhle). The snow wasn’t good at the beginning of December and the park wasn’t open but we still did more than enough skiing through the week. I had never been to Soll before, I had been to Austria but not Soll. It was good. It’s quiet and small. Picturesque. It’s difficult for me to comment on the skiing because we went in March and it wasn’t the best snow. It got choppy and slushy, especially towards the end of the day. 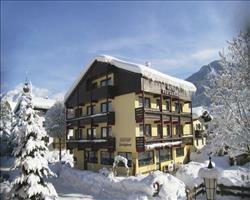 I imagine in Janurary or February it would be very good, it’s a very well linked resort, there is lots to ski. "Get the locals/reps to explain the piste map before you ski!" Booked this 3 days before we left! I think the weather was against us as the easier slopes were slushy. There was beginner stuff and advanced stuff but less for intermediates, so we were either skiing really easy slopes or the top end of reds (which were more like blacks). The piste map is rubbish so you need local reps to pass on some local knowledge. "SkiWelt is big - we're returning visitors"
I previously skied in Soll a few years ago and returned last year with my girlfriend. I’d say it was best for beginners and intermediates in terms of the ski area. One really good thing is the SkiWelt area which is pretty big. We got the whole area pass and there was plenty of skiing for the week. The village itself is a nice and pretty wee place, with a few pubs etc. We normally go to higher resorts at the time of year we visited Söll (late March) and it would’ve been better if we had as the snow quality wasn’t great. The ski area is quite antiquated and was lacking steeper slopes for me. I would say it’s best for intermediate/red run skiers as my girlfriend who’s a beginner was very restricted, you can’t ski many blues without skiing reds to reach them.